For decades, the Central Wetlands on the eastern edge of New Orleans have seemed little more than a dreary pond with stumps of dead cypress trees poking above its surface like gray razor stubble. But these days, from a lookout point at the upper edge of the wetlands known as Bayou Bienvenue, you can see newly planted islands of spartina grass bringing the moribund marsh back to some semblance of life  enough, at least, to attract the curiosity of egrets. And that could mean more to the future of post-Katrina New Orleans than any number of levees, tourists or Super Bowl victories ever will. Those floating islands are the first, long-awaited signs of the restoration of Louisiana's Gulf Coast wetlands. The swamps once served as natural buffers for New Orleans against hurricanes, but over the decades their man-made degradation created instead a natural bowling lane, where catastrophic storms can roll into the Big Easy unchallenged. That was the case five years ago this weekend, when Hurricane Katrina and its 125 mph (205 km/h) winds wrecked the Gulf Coast from Louisiana to Florida, caused almost $100 billion in damage and killed 1,800 people. It did its worst damage in New Orleans, where the storm surge tore through the city's shoddy, U.S. Army Corps of Engineers-built levees and flooded the low-lying metro area to its rooftops. As the region and the nation mark the somber anniversary, New Orleans is hailing (warily) the Corps' near-completion of a 350-mile, $15 billion system of new and stronger levees. But engineers and environmentalists alike say it's even more important five years later to get the wetlands revival on track  with the critical object of keeping pressure off those barriers in the years ahead. "The levees aren't going to be as successful against the Gulf of Mexico if we don't do this restoration," says Amanda Moore, Coastal Louisiana Organizer for the National Wildlife Federation. "The city will still be vulnerable." The Crescent City got especially exposed 45 years ago when the U.S. Army Corps of Engineers completed a 76-mile canal, the Mississippi River-Gulf Outlet (MRGO), from the gulf to the city. 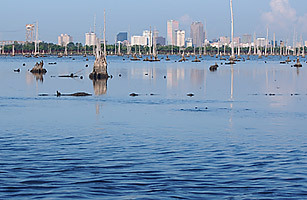 The artificial shipping channel brought gulf saltwater into the wetlands, raising their salinity and killing off the lush, fresh-water cypress swamps  including the 30,000-acre Central Wetlands, which is only 15 minutes from the city's French Quarter. Had they been in their more pristine, pre-MRGO state, the Central Wetlands and other swamps may well have softened the 2005 storm surge that left adjoining communities like the Lower Ninth Ward under water for weeks. Environmentalists, however, say recent changes in Corps management in Louisiana have made them more optimistic that the restoration is a priority again. They point to how the Corps, breaking with past tradition, is encouraging rather than snubbing local community input, which has been abundant. Last spring an alliance of 17 environmental and civic groups, the MRGO Must Go Coalition, issued recommendations for accomplishing the water diversion and other restoration goals. The floating grass islands project is being spearheaded by eco-academics from schools as far flung as the University of Wisconsin in partnership with local groups like the Holy Cross Neighborhood Association of the Lower Ninth Ward. "After Katrina, the coastal wetlands became an important environmental justice issue for a lot of researchers around the country," says Lauren Brown of the water resources management program at Wisconsin's Nelson Institute. In addition, sewage and water boards in New Orleans and surrounding parishes have initiated projects to pump not only fresh water but treated waste water nutrients into the Central Wetlands to jumpstart new plant and tree life. "These various public-private partnerships have proved they can move with more ease than government often does," says Charles Allen, a former bioenvironmental researcher at Tulane University in New Orleans. "They've stood and delivered to get this thing moving forward." Once the wetlands are suitable for vegetation again, the next challenge is planting and nurturing their pillars, the cypress and tupelo trees that once towered over the swamps. (Where, for example, should the Corps dredge for the right sediment to replace the enervated swamp soil there now?) Another is more economic than ecological: resolving a dispute between New Orleans and Louisiana on one side and Washington on the other regarding whether the federal government  given Mister Go's responsibility for the wetlands destruction  should pick up all the multi-billion-dollar restoration project's costs. Either way, people involved agree that one of the more important aims is to keep New Orleanians and Louisianans engaged in the effort. Toward that end, a key restoration component is infrastructure like public viewing and gathering platforms, especially along the Central Wetlands, to let residents appreciate first-hand the importance of the marshes as they come back to life. As if Katrina shouldn't have convinced them already. See TIME's photo-essay "The Story of One Block in New Orleans." See the survivors and heroes of Hurricane Katrina.